Roasting kabocha and yellow onions together until caramelized brings out the sweetness as well as the earthiness of these vegetables before turning them into a rich vegetarian based Roasted Kabocha Soup. I have been seeing a lot of kabocha recipes in my Australian Gourmet magazines. I finally found both green and red varietals at the Berkeley farmers market. What is a Kabocha? It is also known as a Japanese pumpkin throughout Australia, New Zealand, and Southeast Asia. It is the short stubby cousin to our native pumpkin. The kabocha is round but also rather bumpy with knobby skin, the color is either a dull green or red but the insides are an intense red-orange color. It is naturally sweet, even sweet than a butternut squash with a similar texture of a pumpkin. I thought the flesh tasted rather earthy like a russet potato. It is rich in beta-carotene, iron, vitamin C, and potassium. I found the history of the kabocha interesting as well. It is believed that all squash originated in Mesoamerica, but may have been independently cultivated elsewhere. However, the kabocha was introduced to Japan by Portuguese sailors in 1541, who brought it with them from Cambodia. The Portuguese name for the pumpkin, Cambodia abóbora, was shortened by the Japanese to kabocha. This was my first time using a kabocha and I decided that I wanted to make it into a soup. I slowly roasted it with some yellow onions and olive oil until it was caramelized. Then I simmered the flesh as well as the onions with plain water – I find that vegetable stock changes the flavor of soups and takes away from their natural taste. I then pureed the mixture and served it with a piece of fried sage and a drizzle of the sage oil. It was rich in flavor but light in calories. This soup would make a perfect soup course for your Thanksgiving table. Put kabocha and onion in a roasting pan and drizzle with olive oil. Roast for about 30 -45 minutes until soft and caramelized. Remove from oven and gently remove the flesh of the kabocha from the skin. Place the flesh into a large saucepan with the onion and water. Simmer over low heat for about 30 minutes. Puree with a food processor or blender small batches, return to a saucepan. Gently reheat. Heat a small amount of olive oil in a small frying pan and gently fry sage leaves. Before serving drizzle a bit of the sage infused olive oil over the top of soup and float the fried sage leaf in it. 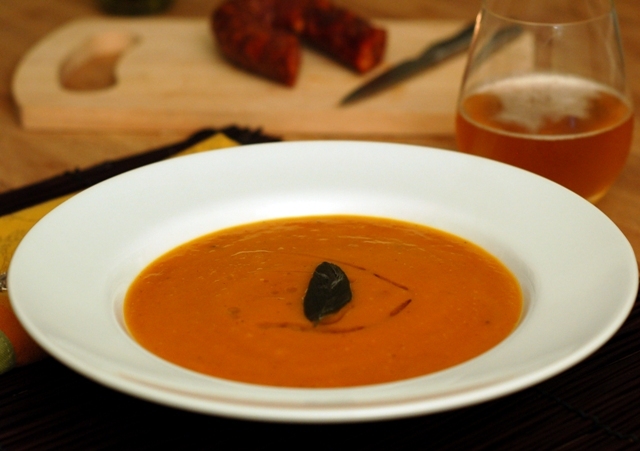 7 Responses to "Roasted Kabocha Soup"
Very nice! Fascinating to read about the origin of the name. It all makes sense now. One thing; if you don't have an immersion blender I highly recommend getting one. They work perfectly for making pureed soups and you don't even have to take the soup out of the pot! I use mine all the time. This is lovely, simple and I am sure really full of flavour. I love the respect you show towards the natural flavour of the Kabocha, caramelising it to bring them out and handling so gently through the process. You even held back vegetable stock so as to let those flavours shine centre stage: I agree with you and I appreciate that. Many thanks for this post! Woo hoo...love the addition of peppers in this soup...doubly sweet! Perfect timing! I just roasted a kobacha squash last night (my first one also) that came in my CSA box and was thinking about making it into soup. I tried a little and was surprised at how good it was—much better than the butternut squashes I've been getting in my box. If only I had a penny for each time I came here! Amazing read.